I was so excited to wear my J.Crew sequin striped top and when I stumbled on this silk shirt in a perfect match from Ann Taylor, I knew I had an awesome outfit. 🙂 I was going to wear this outfit with gray boots but my photographer, Chani Deutsch, encouraged me to wear the neon pink flats. Once you’re going for color, do it all the way, right?! 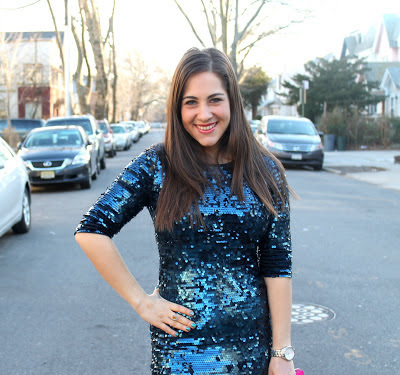 Sequins and Polka Dots, my friends! I’m a bit self-conscious of these pics; I don’t usually wear such fitted clothes as I’m sure you’ve noticed:) But I love a good navy and pink color combination and the dress is fun-I just don’t know if I’d ever have the guts to actually wear this out! If I hear one more time about how great Maybelline Great Lash Mascara is (ya know, the pink and green tube), I’ll scream! There is NOTHING great about this mascara. It creates no thickness, has very average lengthening abilities and has some flaking too. L’oreal Double Extend Lash Boosting Mascara is a great choice and I find it works even better without that clear base coat. 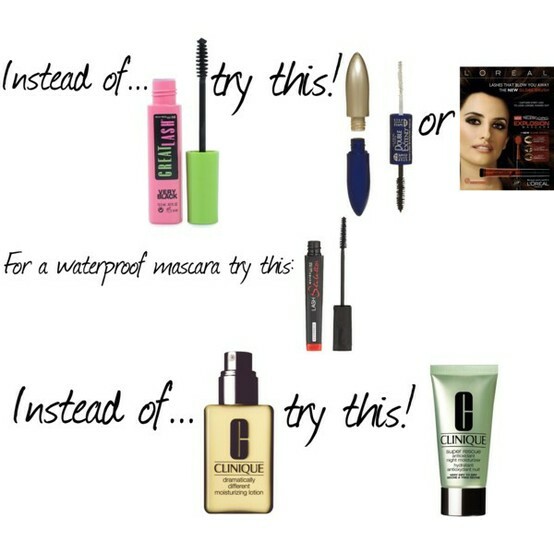 I’ve heard great things about Telescopic Explosion Mascara as well as Maybelline Lash Stiletto Waterproof (the regular version isn’t as good). Clinique Dramatically Different Moisturizing Lotion is THE most overrated moisturizer out there (in my opinion he he). Is it bad? No! So why do I say that it’s so overrated? Because it’s just super outdated and very average. There are so many great moisturizers with antioxidants, ingredients that are beneficial to skin, anti irritants, etc and this moisturizer has none of that. It just has some mineral and sesame oil and you can do way better for your skin. By the way, the Dramatically Different Moisturizing Gel is much better than the lotion. It feels light and silky and is great for normal to slightly oily or slightly dry skin; it has some antioxidants although not a lot of it but it’s well priced and a decent option. Clinique Super Rescue Antioxidant Night Moisturizer is great but definitely more pricey. Did I just knock your favorite product? 🙂 Let me know! Tell me what you like…or what you don’t like!